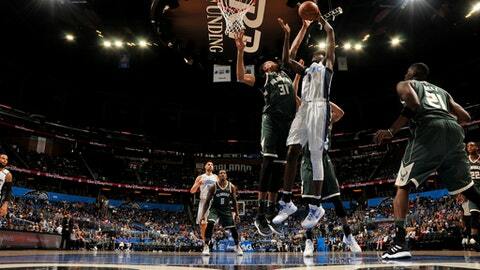 ORLANDO, Fla. (AP) A little redemption for the Orlando Magic was a big blow to the Milwaukee Bucks. ”We were able to bounce back with some enthusiasm,” Simmons said. Coach Joe Prunty, who described the Bucks’ effort as ”horrible,” didn’t see much energy from his team on the defensive side of the floor. Bucks: G Brandon Jennings, who returned to the NBA with 16 points and 12 assists in Monday night’s win at Memphis after signing a 10-day contract, had two points Wednesday night. Magic: G Evan Fournier missed a fourth straight game with a sprained left knee. Magic coach Frank Vogel got his 300th career victory in what he described as the toughest game on the schedule. ”It’s a zombie game when you come back from the West Coast into a back-to-back, and the guys just don’t have it in their legs to make shots, and in their minds to focus,” he said. ”Our guys played mentally tough and got a difficult W.” Vogel is 300-282 in eight seasons at Indiana and Orlando. Bucks: Host Atlanta on Saturday night. Magic: Host Boston on Friday night.